This post contains links to existing threads about class balance, mechanics changes and early feedback. This post is not meant for actual discussion of these topics, only to redirect you there. Edited by dam, 01 February 2018 - 08:29 AM. Edited by IndiraLightfoot, 21 November 2017 - 12:26 PM. EDIT: Oops, Strongest build is already on there. Edited by Tamerlane, 21 November 2017 - 11:56 PM. I imagine that this thread may become interesting and useful along the way, when new patches get released. The (newer) thread about afflictions and their severity. And my older one, 'cause why not. My apologies, I was off the whole week for work. It's one forum "up" though. Edited by Dr. Hieronymous Alloy, 18 December 2017 - 05:31 AM. Edited by MaxQuest, 22 July 2018 - 02:42 AM. Erm... Why do you need Concentration if you can't get interrupted anyways (looking at you, Courageous)? Technically concentration is now discreet. One charge would eat one interruption. While during courageous you could ignore all interruptions, nevertheless of their amount. Afaik Brilliant, Enfeebled, Resolute and Energized are not associated to any spell or ability in the current beta. Have found them in the game files. EDIT: I had posted here the damage formula found by MaxQuest in beta version 2. Now in Beta version 4 a different formula is used. I have posted the new damage formula in a new post in this thread. I do not know if the formula of MaxQuest was correct in beta version 2 and they changed the formula or if he made a mistake. In any case we have to thank him a lot for many things, in this case for finding out that negative damage modifiers get inverted. Edited by Madscientist, 04 May 2018 - 04:43 AM. Its the first post in this thread and its really complicated, so the link should be enough. 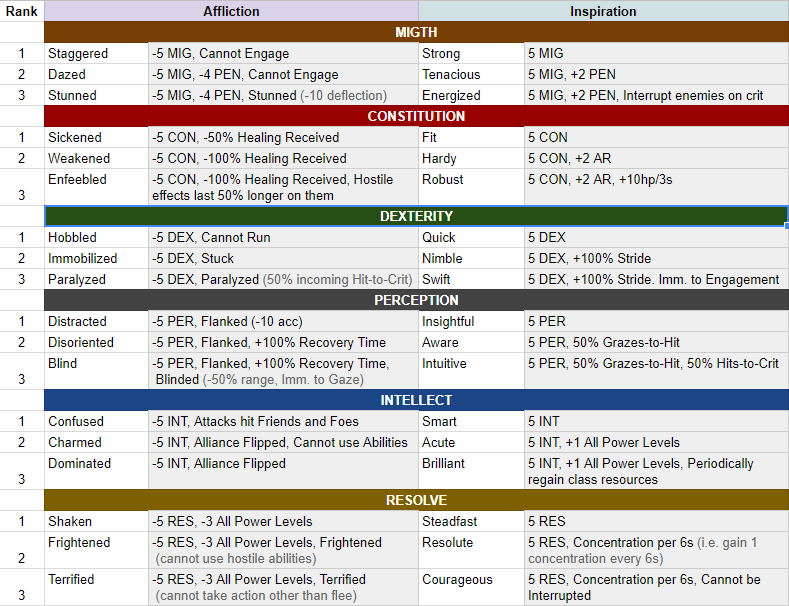 MaxQuest had also a table with all weapons (damage, penetration, speed, weapon specific bonus, what the profiency modal does, . 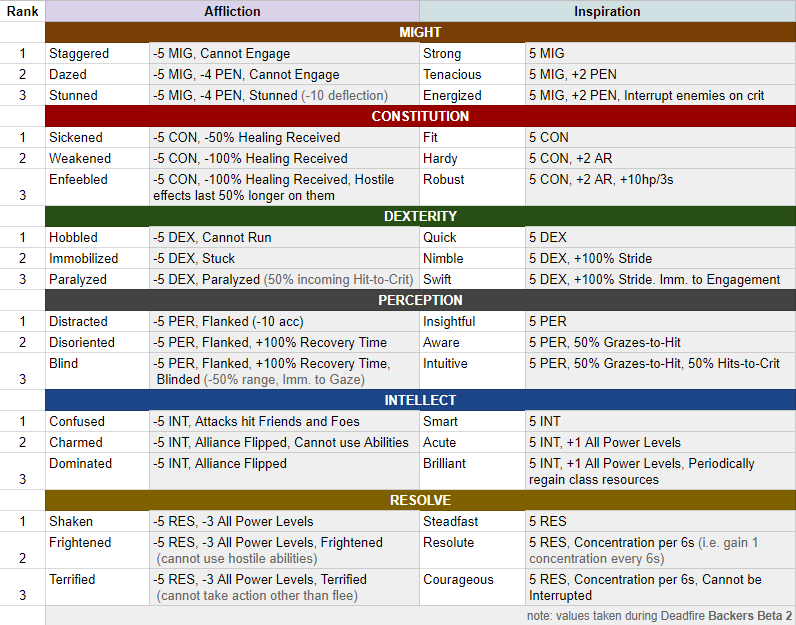 . . ), similar to the stat effect table he posted above. I would like to post it as well, but I cannot find it at the moment. 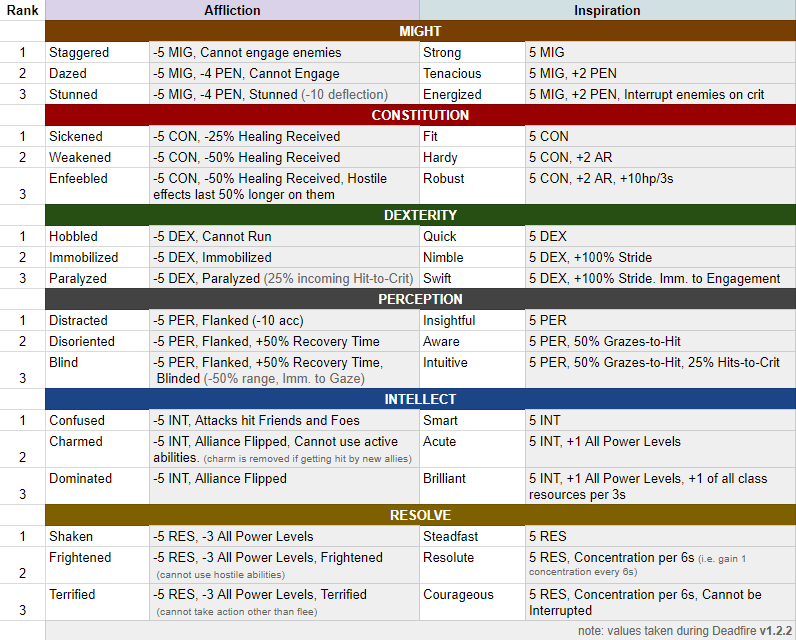 MaxQuest, oh grand master of game mechanics , would you please grant your infinite knowledge to the dump masses and post the table here too.